not long ago i found a ferret wondering around my garden so we rescued her and posted notices all over town and after a month no one claimed her ( don't understand why she's beautiful ). so i decided too keep her she is so friendly and loving and seems really happy with us. i would be really interested in knowing some good tips, what treats are really good and how too keep them happy. Her name is rosy and she is beautiful i have fallen in love with her and want to keep her happy. Looks like Rosy is really lucky and happy to have wandered into your life. 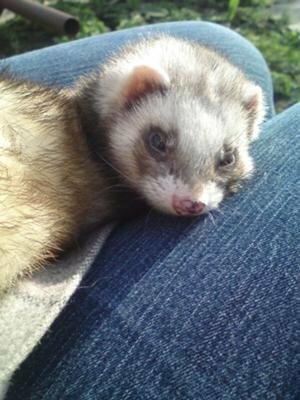 You can find quite a few ferret care tips on my site, but I'll give you a few quick ones right here with links to more info. * Exercising your ferret is very important to keep it healthy. Give Rosy at least 2 hours of playtime out of her cage. * Save some money for unexpected vet bills (well actually, they're not that unexpected if you own ferrets). * Give high quality ferret food. Yes it's more expensive, but you'll save lots of money on visits to the vet and have a healthier fuzzy. * Fuzzies are too smart for their own good. Make sure your ferret proof the room Rosy can romp around in and take a look at these ferret training tips.